Why was Our Lady of Fatima so concerned about Russia? Of course, St. Pope John Paul II entrusted the world to the Immaculate Heart in 1984, but we still await that period of peace. We have seen more war, massacres, martyrs, and abortions in the last half century than ever before. Ominously, we have not yet seen the annihilation of various nations. But what does all this have to do with Russia? Russia, in the minds of most people, is the originator of communism – thought mainly to be an economic system competing with capitalism. However, when we really comprehend communism, the spread of Russia’s errors becomes recognizable. Infiltrate the churches and replace revealed religion with “social” religion. Discredit the family as an institution. Encourage promiscuity, masturbation, and easy divorce. Beyond communism, however, another of Russia’s errors has spread throughout the world – abortion. Abortion was first legalized in Russia in 1920. To this day, Russia has the highest abortion rate in the world per capita. With a population of 143 million, there are 1.2 million abortions per year. There is no doubt Mary’s predictions and promises will come true. 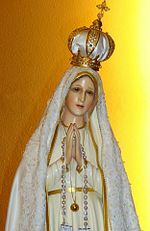 Our Lady of Fatima predicted the Second World War and even noted a warning sign that would precede it. She warned of the massive plague of impurity that has infested the planet. She gave the faithful tasks to fulfill in order to see the Triumph her Immaculate Heart and she will be faithful to those prophecies too. So, as we honor our own mothers this month, let’s examine again the requests of Our Blessed Mother and put them into practice. She asked for prayer, particularly the Holy Rosary and the devotion of the Brown Scapular. She urged reparation for the sins and outrages perpetrated against God’s Grace and blasphemies against the Holy Hearts of Jesus and Mary, especially with the practice of the First Five Saturdays. And finally, she asked for consecration to the Immaculate Heart of Mary, both on a personal basis and, publicly, that of Russia by the Pope and all the world’s bishops. This entry was posted on Friday, May 5th, 2017 at 7:28 pm	and is filed under News & Commentary. You can follow any responses to this entry through the RSS 2.0 feed. You can skip to the end and leave a response. Pinging is currently not allowed.